Three Canadian scholars with backgrounds in various approaches to health research and bioethics find that, contrary to their expectations, many REB members and staffers believe that "ethics creep" is real. The authors have collected interesting thoughts from REB staff and members, but the authors' analysis and their own proposals for reform are unclear. The article begins with a discussion of the scholarly literature surrounding ethics review. Guta et al. have assembled an impressive bibliography, and they acknowledge social scientists' widespread dissatisfaction, but they don't fully understand the critique. For one thing, they misdate by decades the beginnings of scholars' complaints. For example, they write, "the concept of ethics creep has been linked to the erosion of academic freedom. This claim was first advanced by Haggerty (2004) . . . ." Haggerty's article is great, but back in 1966, the Society for the Study of Social Problems warned that "the power vested in such committees could be used to encroach upon academic freedom," and ever since social scientists have voiced similar concerns. Second, Guta et al. don't seem to understand the concept of critical inquiry. "Do we not have a shared interest in promoting research that does not harm (in the broadest sense) participants?" they ask. No, we don't, or at least, that's not all we have. As TCPS2 explains, "some research, involving critical assessments of public, political or corporate institutions and associated public figures, for example, may be legitimately critical and/or opposed to the welfare of those individuals in a position of power, and may cause them some harm." Third, Guta et al. think that ethics review is comparable to peer review, noting "We are aware of the many documented examples of thoughtless and ineffective ethics reviews, along with other less discussed, but equally ineffective academic processes such as grant reviews and manuscript reviews." Later, they assert that "ethics review is similar to funding review, and we would add many other forms of ‘examination’ on which the academe is based" and that "many researchers will end up sitting on an REB/IRB at some point." Such statements ignore important differences that have been well articulated by critics. For example, Charles Bosk, whom they cite, has described ethics review as "faux peer review" on the grounds that key decisions are made not by peer researchers, but by professional staff. Nor do they address the disciplinary imbalances among researchers who do serve on ethics committees, a point raise by Will van den Hoonaard in The Seduction of Ethics. Based on these incomplete understandings of scholarship they cite, Guta et al. seem to have begun their research thinking that critiques of ethics review are overstated. They decided to ask "how ethics creep is experienced from the perspective of REB/IRB members and staff . . ."
We identified 18 REB/IRBs to sample and, of those, we successfully recruited from a total of 24 participants from 7 of them (with 1 participants recruited per REB/IRB). Of the original 18 REB/IRBs, one declined outright stating lack of interest, another said they do not review the type of research we were interested in and so were ineligible, a third required us to first go through an ethics review at their home institution and then declined to participate after we had received ethics approval, and a fourth told us we would have to add a researcher from their institution as a co-investigator, which we declined. Despite these obstacles, the authors were able to interview 24 REB members, staffers, and "other key informants working in ethics policy reform" about "their experiences reviewing protocols that used a community-engaged approach," though they found people more eager to speak "about how their REB/IRB reviews research in general." Some had good things to say about what they are doing, or at least about what they would like to do. As one board member put it, "One of our goals is to build capacity in our community. That is something we’re looking for. Are you going to be hiring anybody in the community to do this work with you? Are you going to be training anybody? We see it as positive, something we’re looking for." But the researchers also heard about the system's flaws. "To the research team’s surprise," they write, REB members and staffers acknolwedged the existence of "ethics creep." Staffers complained that “I think the focus is really shifted from ethics to risk management” and “I spend all of my time enforcing compliance which is not what I thought I was hired to do.” Another noted, "The ethics creep is always there. I think we try to fix it on a regular basis, always having discussions about, are we going too far on this, taking the pulse, you know . . ."
Board members concede that researchers find them inaccessible, and that electronic submission can make things worse, both by limiting the amount researchers can write and raising the false expectation of quick turnaround. Staffers and members agree that audits from above reduces their flexibility. They feel they lack time to do their job, and that if they manage to voice a concern, they will be chastised for "slowing down production of this research [and] preventing this university from obtaining its funding." Yet they cannot imagine an alternative. the growing needs of researchers who keep presenting REB/IRBs with new methods and designs, and by institutional strategies that increasingly rely on research funding dollars. There is a simultaneous growing and retreating of ethics review as it expands into new terrain while losing control of its traditional domain. While ethics review may be asking more of researchers working in communities, the pressures of compliance monitoring may be resulting in a system too overburdened to ask basic questions about risk and harm (Lidz et al., 2012). This leaves many REB/IRBs struggling to manage growing expectations from researchers in the face of budget and staffing cuts, while at the same time being required to meet regulatory requirements imposed from outside the academy. This tension serves to create an adversarial relationship between researchers and REB/IRBs who are both struggling to stay afloat in the wake of changes to university cultures and expectations. While we are confident in our assertion, we struggle to make sense of why this has become such a divisive issue in the academy. We are reminded that ethics review is similar to funding review (Hedgecoe, 2008, 880), and we would add many other forms of ‘examination’ on which the academe is based. Yet, there has been far less concern raised over these issues. Borrowing language from van der Hoonaard (2001) and Fitzgerald (2005), we ask; has ethics creep itself become a “moral panic”? We question whether ethics creep has become a repressive hypothesis which belies the complexity of the phenomenon it purports to explain, and, if so, who benefits? 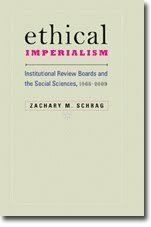 When researchers raise claims of censorship from REB/IRBs, they mean restrictions on their freedom to speak in particular ways; that is, to speak through the authoritative voice of empirical evidence, which is greatly privileged within the neoliberal system that promotes evidence-based medicine, education, and policy. There is little stopping academics from sharing their views through formats that do not require ethics review (e.g., commentaries, theoretical work), but the voice of the funded empiricist has become the dominant voice in the Canadian academy. Guta et. al (who themselves received funding from the Canadian Institutes of Health Research) conclude with a condemnation of "well-intentioned" attempts "to replace one form of governance with another, while continuing to stoke the furnace that fuels the academic industrial complex." Instead, they "encourage greater discussion about how to (re)imagine the ethical researcher in today’s academic industrial complex." If there is a difference in those two approaches, I was unable to discern it. The essay is heavy in Foucauldian jargon, and I may have missed some theoretical niceties while listening for that "authoritative voice of empirical evidence."